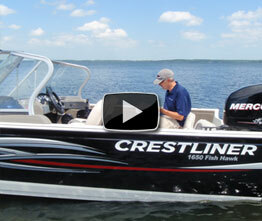 Notes from our video boat review of this sixteen foot fishing boat. 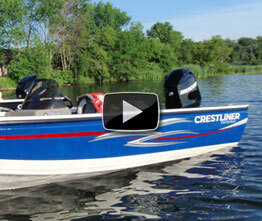 With all its options, our test boat is a great little family fishing rig. The big windshield is plenty tall for my six-foot height, and on a very hot day I still got good airflow with the walk-through opened. 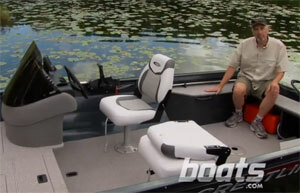 This is a “season extender,” as it will make the boat more comfortable in spring and fall. The optional rear seat has a really narrow bottom cushion, though it might be just fine for smaller kids. (There wasn’t a kid handy at our test site.) But it beats sitting on a carpeted casting platform. During the video production, I flipped the aft seat into its “up” position without getting the latch for the live well folded down, and the weight of seat pushed the latch right through its housing, making the latch unusable. This is bound to happen to an owner. There might be a better, flush latch to use here. Some might see the open rod holders on the port-side inwale as a “small-boat” trade-off to an enclosed locker, but it does put those rods right at hand. And there’s still locking rod storage in the deck. 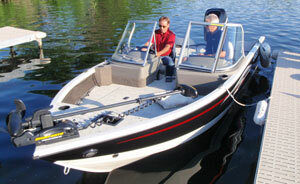 The Lowrance X4 fish locator and MotorGuide W55 trolling motor are standard equipment on the 1650 Fish Hawk. The stereo is an option. I did not get to mention the vinyl deck material in the video. Crestliner calls this a “Northwest Package” because the vinyl has been popular in that part of the country. I’d certainly consider it over carpeting for a fishing boat – over time the carpet soaks up fish slime and blood and mud, and a fishing boat is out in a rain a lot. You can just hose the vinyl clean. I like the color pattern, too. Not as brilliant as all-white, but not so dark that it’s super-hot in the sun. Retail price on the vinyl option is only $310. You can also order vinyl for just the cockpit for $156. Larger Crestliner models also offer snap-in carpet that fits over the vinyl, but it looks like that’s not available for the 1650 Fish Hawk. 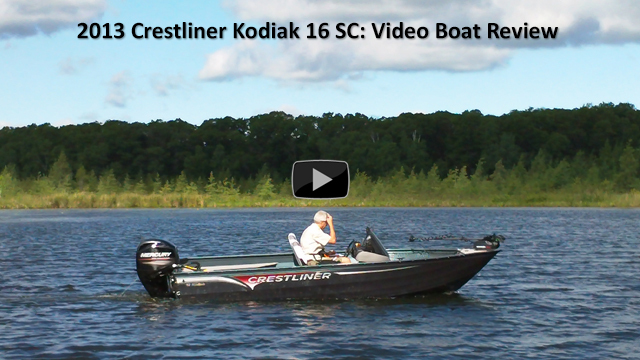 This boat ran well with the OptiMax 90, and for its size the ride was good in some light lake chop. We never got any rough water on this trip. 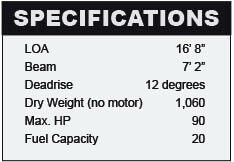 However, it does handle better in turns if the motor is trimmed down first. 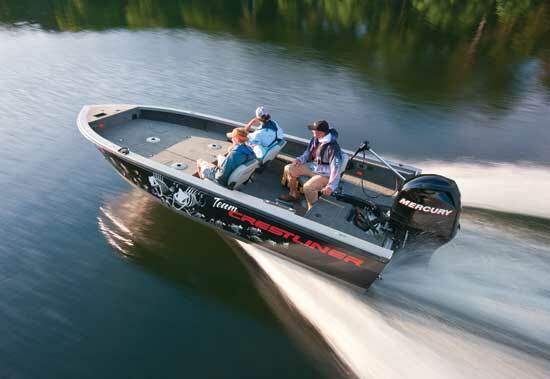 Not all the way, but if you try turns at speed with the motor trimmed out, the hull can skip around a little. This rig did not have hydraulic steering, which would be a nice upgrade. 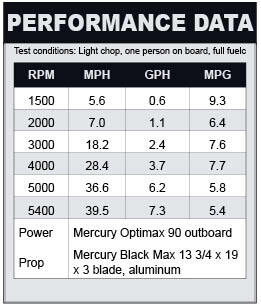 It’s not on this boat’s options list, so would need to be dealer-installed. 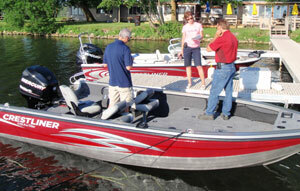 Like most of the V-bottom Crestliner models, the 1650 Fish Hawk features an all-welded, four-piece hull (two panels form the running surface, and two more form the hull sides) which are joined together with aluminum extrusions with tongue-and-groove channels, then welded together. The extrusions double as spray rails and the keel. These boats do not have additional welded or riveted strakes, but seem to get on plane and handle just fine. Another construction feature I like are the wide gunwale caps, which are big and stout enough to mount accessories, but also have a very attractive, smooth shape. Crestliner says the caps are extruded in a softer aluminum alloy to get that shape, and then heat-treated for hardness. They also have a “J-hook” groove that secures canvas instead of snaps. 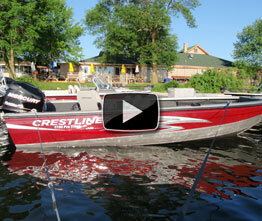 This boat comes with a painted ShorLand’r trailer.